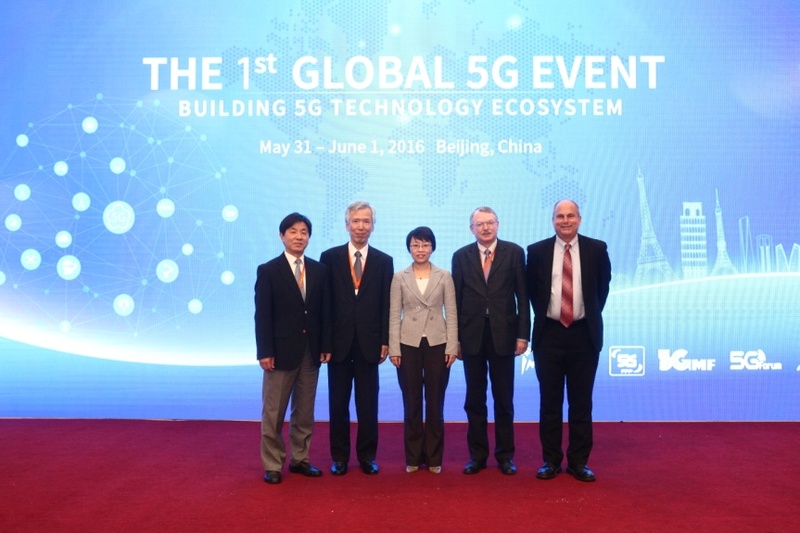 Industry executives representing five of the leading Wireless associations worldwide shared their knowledge at the first of the bi-annual Global 5G events in Beijing on May 31 and June 1, 2016. The latest 5G developments in 5G research, 5G standardisation and 5G Roadmaps were discussed. Hosted by IMT-2020 (5G) Promotion Group in China with the theme of “Building 5G Technology Ecosystem”, the conference was jointly organized by: The 5G Public Private Partnership (5G PPP, Europe), IMT-2020 (5G) Promotion Group (China), The Fifth Generation Mobile Communications Promotion Forum (5GMF, Japan), 5G Forum (Korea) and 5G Americas (Americas). During this two-day event, over 500 government representatives, association leaders and industry experts participated and shared the latest Research and Development (R&D) achievements.Huawei, Qualcomm, ZTE, Nokia Bell Labs, and Samsung spoke on system design; China Mobile, Datang Telecom, Intel, MTK and Ericsson spoke on the new air interface; China Telecom, Docomo, Orange Labs and KT discussed network and operation; Google, Lenovo, Spreadtrum, LG and Coolpad spoke on terminals; and verticals were scheduled to have representatives from Baidu, Volvo and Foxcomm. The first Global 5G Event was an important milestone for building the 5G technology ecosystem and laid a good foundation for the globally unified 5G standard. The five organizations will further strengthen communications and cooperation in 5G technology, standard, spectrum and trial, and jointly promote to establish a global 5G ecosystem. The Second Global 5G Event will take place in Rome (Italy) on November 9-10, 2016. 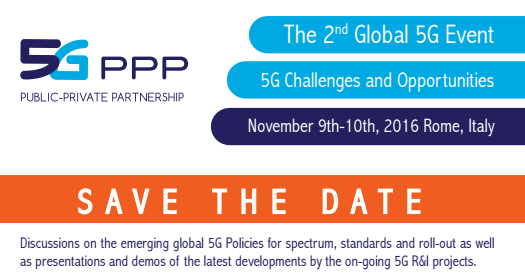 As with the first Event, this Global 5G Event will run over two days, providing a gathering place to have discussions on the emerging global 5G Policies for spectrum, standards and roll-out as well as presentations and demonstrations of the latest developments within the European 5G PPP projects. 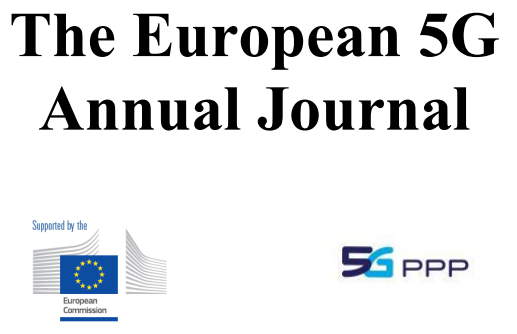 The European 5G Annual Journal has been released! The first European 5G Annual Journal was released in July 2016. The aim of this first edition is to highlight and disseminate European achivements in the context of global progress in the 5G PPP domain. It présents an analysis of the 5G ecosystem evolution over the past year. It has been prepared by Euro-5G with inputs from the 5G PPP projects. An updated version will published before year-end 2016. The Journal consists of 50+ pages, divided into 6 main chapters. A quick overview of each chapter is as follows. Context: this chapter sets the scene for 5G development. What are the challenges, what has been done so far, and what are the milestones going into the future? The 27th IEEE PIMRC will be held in Valencia (Spain) from 4th to 7th September 2016. It will cover wide range of topics in wireless communications, networks, services, and applications by hosting Keynote Speakers and Main Technical sessions under 4 Tracks, 6 Tutorials and 8 Workshops. At this event, 5G PPP projects will present first outputs. METIS-II is organising the panel 1 “What is relevant research for 5G Advanced? CHARISMA is organising the “5G strengthening business and social development: barriers and drivers” workshop on 4th September 2016, mmMAGIC will present papers. 5G NORMA and COHERENT 5G PPP projects jointly organise a workshop on Virtualised Coordinated Spectrum Access for 5G Communications Systems at ISWCS 2016. This workshop aims to bring the concepts of dynamic allocation of Spectrum to network services and virtualisation together and explore if and how novel architectures and technologies based on virtualisation can increase the efficiency in Spectrum utilisation. This workshop is jointly organised by 5G PPP projects METIS-II, FANTASTIC-5G, mmMAGIC, 5G-Crosshaul and Flex5Gware, and aims to foster the discussion and consensus building on key 5G RAN design aspects. The workshop will provide the opportunity to share and discuss results from the mentioned projects and other 5G research activities, and to elaborate on how the 5G RAN design shall be best taken forth in the recently started 3GPP standardisation.